…the premium supplier of high-end products and services for the fascinating activity of Zorbing. Zorbing is one of the most exciting inventions of the past decade and we from DOWNHILL REVOLUTION offer you a superior product range with outstanding and ruling properties for this thrilling activity. The downhill zorbing experience, promotional zorbing events, company incentives, family days, zorbing shows – the Advanced Way of Zorbing with DOWNHILL REVOLUTION is exciting, safe and always new. Enjoy your visit on our english website – and join the REVOLUTION. 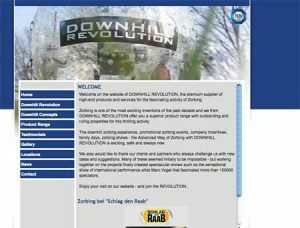 Link to the english Website from ZORB® Europe – Downhill Revolution!